An observation by Galileo may have been discovery of the planet Neptune, 243 years before its existence was generally recognized. J. Palisa discovered asteroid #142 Polana. The Societe Astronomique de France (Astronomical Society of France) was established by Camille Flammarion and 11 other initial members in Flammarion's apartment at 16 rue Cassini, close to the Paris Observatory. A. Charlois discovered asteroid #282 Clorinde. A. Kopff discovered asteroid #679 Pax. M. Wolf discovered asteroid #862 Franzia. M. Wolf discovered asteroid #1069 Planckia. K. Reinmuth discovered asteroids #1143 Odysseus and #1144 Oda. A. Patry discovered asteroid #1516 Henry. Goethe Link Observatory discovered asteroid #1615 Bardwell. The first public demonstration of "satellite communications" was made with a photograph of the USS Hancock (CVA-19) bounced off the Moon between Oahu, Hawaii and Washington, DC. K. Jensen and K. Augustesen discovered asteroid #3309 Brorfelde. E. Bowell discovered asteroid #3064 Zimmer. NASA's Space Shuttle Challenger exploded 73 seconds after launch, killing all seven crew members. STS 51-L was the first Shuttle liftoff scheduled from Pad B, the 25th launch of a Space Shuttle and the tenth launch of the Challenger. The launch was initially set for 3:43 p.m. EST, 22 January 1986, slipped to 23 January, then 24 January, due to delays in Mission 61-C. The launch was reset for 25 January because of bad weather at the transoceanic abort landing (TAL) site in Dakar, Senegal. To utilize Casablanca (not equipped for night landings) as alternate TAL site, T-zero was moved to a morning liftoff time. The launch was again postponed a day when launch processing was unable to meet the new morning liftoff time. Prediction of unacceptable weather at KSC led to the launch being rescheduled for 9:37 a.m. EST, 27 January. The launch was delayed 24 hours again when a ground servicing equipment hatch-closing fixture could not be removed from the orbiter hatch. The fixture was sawed off and an attaching bolt drilled out before closeout was completed. During the delay, cross winds exceeded return-to-launch-site limits at KSC's Shuttle Landing Facility. The launch on 28 January was delayed two hours when a hardware interface module in the launch processing system, which monitors fire detection system, failed during liquid hydrogen tanking procedures. An explosion 73 seconds after liftoff, the result of the failure of an O-ring seal in the right solid rocket booster (SRB), claimed the crew and vehicle. Shuttle flights were halted while an extensive investigation into the accident and an assessment of the Shuttle program was conducted. Among the crew was Christa McAuliffe, scheduled to be the first teacher in space. Planned objectives were deployment of Tracking Data Relay Satellite-2 (TDRS-2), and flying of the Shuttle-Pointed Tool for Astronomy (SPARTAN-203)/Halley's Comet Experiment Deployable, a free-flying module designed to observe the tail and coma of Halley's comet with two ultraviolet spectrometers and two cameras. Other payloads were the Fluid Dynamics Experiment (FDE); the Comet Halley Active Monitoring Program (CHAMP); the Phase Partitioning Experiment (PPE); three Shuttle Student Involvement Program (SSIP) experiments; and a set of lessons for the Teacher in Space Project (TISP). Launch weight: 268,829 pounds. Mission duration: 1 minute, 13 seconds. Orbit altitude: 150 nautical miles (planned). Orbit inclination: 28.5 degrees (planned). Miles traveled: 18 miles. The STS 51-L flight crew was: Francis R. Scobee, Commander; Michael J. Smith, Pilot; Judith A. Resnik, Mission Specialist 1; Ellison S. Onizuka, Mission Specialist 2; Ronald E. McNair, Mission Specialist 3; Gregory B. Jarvis, Payload Specialist 1; Sharon Christa McAuliffe, Payload Specialist 2 (TISP). 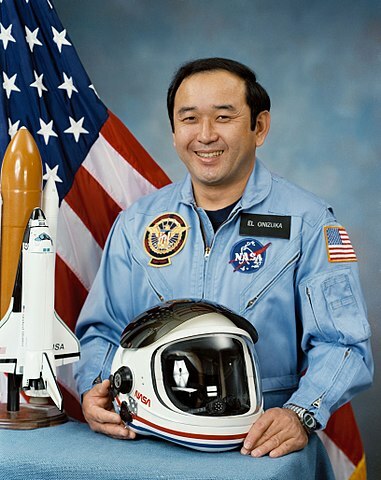 T. Niijima and T. Urata discovered asteroid #3585.